San Francisco is known for its outstanding and inventive food, and we’re lucky that there is no shortage of new and exciting eateries opening every month. Still, while dining at the hottest new spot is fun, it won’t get you the kind of local cred you’ll earn for dining at these seven San Francisco institutions. Dare we say, you shouldn’t consider yourself a local until you’ve crossed these off of your dining bucket list. And then put them right back on it again. Cliff House was constructed in 1863 and has hosted President Ulysses S. Grant (who, while there, used a telephone for the very first time), Buffalo Bill, Mark Twain and William Taft. It's had an entire wing destroyed by a dynamite-loaded schooner that crashed into the rocks at Point Lobos, was burned to the ground on Christmas Day, went through several remodels, burned down again and was finally restored to its 1909 neoclassical style in the early aughts. A main draw is the view of Seal Rock and the Pacific, but the Bloody Mary is a classic for a reason. This Bay Area institution has been serving locals and tourists prime rib and martinis in a charmingly old-fashioned space since the 1940s, and shows no signs of slowing down. Prime rib is the only thing on the menu (okay, there’s also a fish of the day, but no one is going to the House of Prime Rib to eat fish), which means your only decision is which of the four cuts to get. All of the meat is corn-fed, aged for 21 days, then roasted in rock salt and carved tableside by chefs wearing head-to-toe white, including tall starched hats that would feel over-the-top in almost any other setting. When it comes to burritos, there’s no shortage of opinions about which local taqueria serves the best one, but thanks to a slew of awards and consistently long lines, it’s hard to argue that a super burrito from La Taqueria shouldn’t be in steady rotation for every San Franciscan. Yes, despite the controversial fact that La Taqueria doesn’t put rice in its burritos. This neighborhood hofbrau has been a favorite with locals ever since it opened in 1947 thanks to the platters of affordable meat, large beer selection (over 100), quick service and welcoming attitude. There’s often a line out the door, but it moves fast as people slide their trays along the buffet where the meat is expertly carved-to-order (the buffalo stew is in high demand) and the only form of payment accepted is cash. Many of the red-and-white checkered tablecloth-covered tables are communal, which means construction workers end up in conversation with finance guys, and grandparents chat with hipsters, while everyone enjoys a feast that won’t break the bank. Photograph: Yelp/Boss and Boss E.
Tadich Grill isn’t just San Francisco’s oldest restaurant (it opened in 1849), it’s also the oldest restaurant in all of California. This upscale eatery doesn’t take reservations and doesn’t play favorites, which means everyone waits, even Herb Caen (who was a regular), Joe Montana and Jack Nicholson. Herb Caen wrote fondly of the famed Hangtown Fry (oyster and bacon frittata), but Tadich is also known for its seafood cioppino, which is probably the best in all of SF. 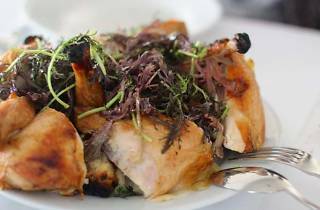 Zuni Cafe is practically a newcomer compared to all the other spots on this list, but even though it’s only been open since 1979, it’s established itself as a quintessential San Francisco restaurant with a laidback vibe and upscale food. 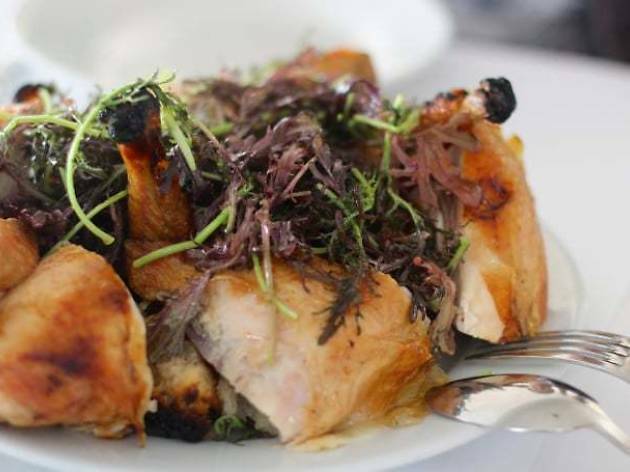 The chicken for two roasted in the wood-fired brick oven and served with a warm bread salad is legendary for a reason, as is the Zuni Caesar salad, but the key is to go often enough that you can break away from the classics and explore the whole menu.